Forget the boring Bavarian covered with a smidge of sweet! 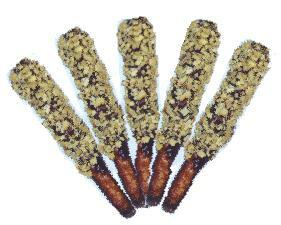 Our chocolate pretzel rods are all that and a crispy crunch! There's no secret here - we take a good thing and go overboard. First with a layer of creamy, chewy caramel, then a thick layer of homemade chocolate. Then, if the mood strikes us we top it with chopped peanuts....sometimes with cookie crumbs! Order some and enjoy! Get our Incredible Milk, Dark or White Chocolate With Caramel Amazingly Delicious, Wonderfully Satisfying, Devilishly Dipped Pretzels Today! All Pretzel Prices Include Shipping! 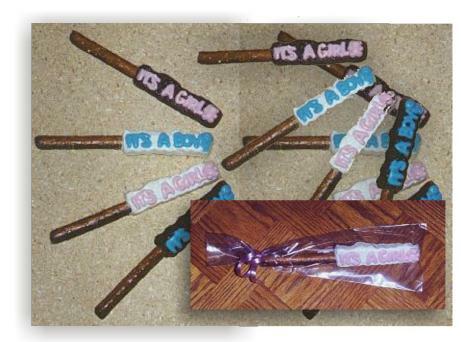 The sweetest way to introduce a bundle of joy. Each pretzel is individually wrapped and wonderfully delicious!